I received an e-mail update from Tom Lambdon, founder and chairman of the political action committee (PAC) Vote on the Pier with details on the Preserve Our Waterfront Referendum. This link will take you to a Facebook page with all of the details. 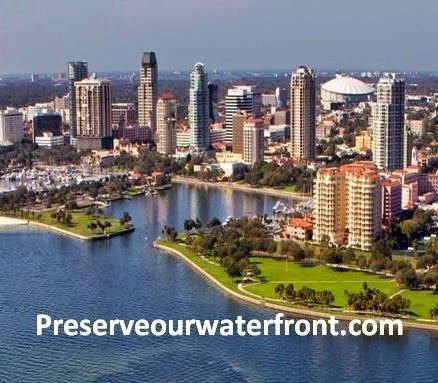 "We have about six volunteers that are manning – and updating this new FB Page – and it contains links to our main website for VoteOnThePier.com – which is the legally registered Political Committee – that is the legally registered SPONSOR PAC (as required by the State) of the Waterfront Charter Amendment Petition"
"None of us are against development. That is NOT what this latest petition is about. We just believe ANY demolition or construction upon downtown waterfront property DESERVES to be decided by City VOTERS – and NOT by a handful of temporary elected officials – that just want to place their name on a project on that unique and precious waterfront acreage – which is owned by each and every taxpayer of the City. I believe you would likely agree." With only a very cursory review of the proposed Waterfront Master Plan, it looks like a development driven initiative and once in place they will nibble away at the waterfront and this Plan will make it very difficult protect one of St. Petersburg's most valuable assets. One only has to drive through Madeira Beach and on up through Indian Rocks to see what happens to the waterfront and waterfront access when the developers, chambers of commerce and other special interests take control. If you are a St. Pete resident, go to the web page above follow the links and get a Petition. Print it, sign it and mail it in. That's all you have to do. In the next general election, you will have the opportunity to vote for the Referendum and take control of your St. Petersburg Waterfront.